Lockable unit is perfect for public areas with little worry of tampering with displayed notices! 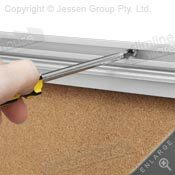 Wall-mounting hardware included to install noticeboard in landscape or portrait orientation! Large 820 x 570mm sized area perfect for placing posters or multiple notices! Self-healing corkboard surface will accept push-pins, staples & tacks – 40 push-pins included! 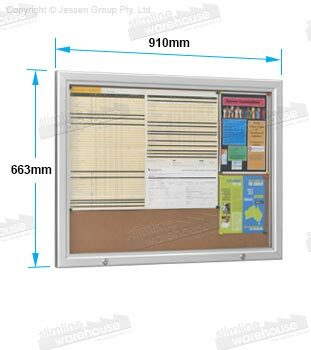 This glass-like fronted notice board makes it easy to show passersby information such as restaurant menus, cafe specials, sales at department stores, upcoming community events, and school club information. Some of the places that find this noticeboard a useful display include universities, exhibition halls, restaurants, museums, office parks, retail stores, and transit stations! 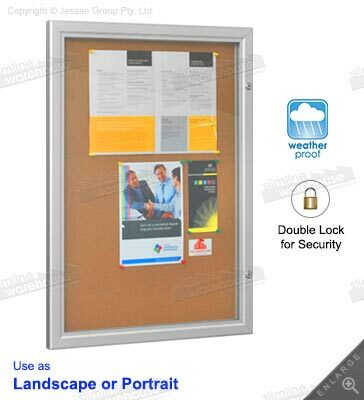 The enclosed noticeboard display, glass-like fronted notice board is a lockable display that allows for placement in public places without worry of the interior being tampered with. A polycarbonate front lens is shatter-resistant and strong, making it easy to read displayed content whilst protecting your display! This cork noticeboard is 820 x 570mm sized to provide plenty of space for placing notices, flyers, and posters to advertise and promote. The large display features a self-healing cork surface that will last for years to come, accepting of push-pins, staples, & tacks. 40 push-pins are included to hold your notices in place! An enclosed bulletin display is a waterproof unit, able to be used both indoors and outdoors without issue. 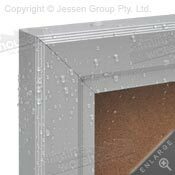 A rubber gasket surrounds the interior frame, helping to prevent water from seeping inside and damaging the displayed contents! This aluminium display is durable to hold up to the rigors of being displayed in heavily-trafficked areas, and the satin silver finish matches well with any décor! This wall-mounted unit includes hardware for installation onto most wall surface types. The versatile unit can be mounted in both portrait and landscape orientation. 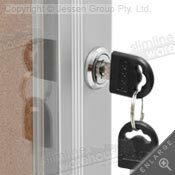 If unsure whether the included hardware is right for your needs, please consult with a professional prior to installation. Order one of these high quality lockable boards today for your business! 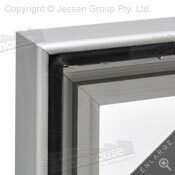 Finish: Clear anodised aluminium frame with dual locks. Noticeboard displays are an attractive & easy way to provide your visitors with information in a safe manner. The enclosed bulletin boards includes a variety of sizes, finishes, & styles that allow you to find the right fit for your specific needs & décor! The extensive online catalogue is available to browse by clicking here, with a huge range of different products to choose from in order to outfit your business in style without breaking the bank. New items are added weekly to give your company the latest trends & technologies to choose from to stay ahead of the competition! Slimline Warehouse is a leading Australian provider of retail, POP, POS, & exhibition displays to businesses nationally. Our low prices & high-quality goods have made us a favourite, growing a large, loyal customer base. Same day despatch is provided with most in stock items if purchased by 1pm EST to anywhere in Australia, including Sydney, Melbourne, Perth, Adelaide, Brisbane, Gold Coast, Cairns, & Hobart!